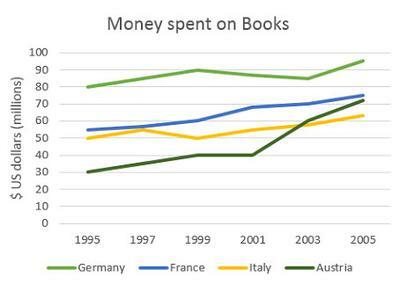 The graph shows the amount of money spent on books in Germany, France, Italy and Austria between 1995 and 2005. The line graph elucidates information on the money spent on buying books in the four various countries-Germany, France, Italy and Austria-for 10 years period from 1995-2005. An overall impression reveals that there has been a different trend for the amount of money spent by people from the different countries but the figures in Germany showed the greatest increase of money spent in book purchasing as this made up the largest amount of millions spent in buying throughout most of the time (1995-2005). The proportion of people buying books in Germany portrayed 80 millions in 1995 but this figure surged to 95 million by the end of the year 2005.France and Italy showed proportions approximately similar to each other with fairly constant trend in 1995 to 1997 but both reached its peaked by the year 2005 (around 50-75 million respectively). However, Austria showed a gradual incline starting 1995 to 1999 then surged to a high of 65 million in 2005. It's interesting to note that the amount of millions spent in buying for German people consistently raised from the start till the end of 2005 compared to the three various countries. It’s generally a good answer with some good language and grammar. But it could be improved in a number of ways. Firstly, be careful about your language of change. I would not call the change occurring in Germany a ‘surge’. This indicates quite a sharp move up, but I don’t think this is the case. It is fairly gradual over the period. It may be that you are just referring to 2005, but that is not clear. If you want to just refer to that time you should say ‘in 2005’. You describe Austria’s move from 1995-2005 as a ‘surge’ – this is more acceptable as it climbs more noticeably and suddenly from 2001. “Sales of books in France and Italy, which started much lower than Germany at around 50 million, followed a similar pattern”. You’ll notice that you also then get a relative clause in, thus giving you a complex sentence. Also, if one line crosses another, this is usually a ‘key feature’. So you should mention the fact that sales of books in Austria overtake Italy in 2003. The line chart compares the money in dollars spent on books in Australia, Germany, Italy and France in 10 year period. It is obvious that money spent in all for countries increases uring the perio shown. Germany spent by far the highest amount of money than any other country. In 1995 Germany spent 80 billion dollars for books. By contrast, the figure for Australia was the lowest at 30 million dollars that is around three times less than in Germany. France and Italy had nearly the same trend in 1995 around 50million dollars. In 1999 the figure for all countries increase, but in Italy it declines back at 50 million. From 1999 to 2001 money spent for books in Australia stay steadily at 40 millions. Figure for Germany slightly declines an reaches 83 millions from 90 millions. All Four countries reach their peak in 2005. Where Germany allocates 95 millions, France 75 millions, Italy 55 millions. Australia spends twice as it did in 1995. The given Line Graph illustrates the amount spent by four countries on books from 1995 to 2005,a period of 10 years.During this period Germany took the peak position on the whole period and Austria had a sharp incline from 30 million to 65 millions. initially,Gremany was at the peak position by spending 80 million dollars in 1995 and this increased to 95 dollars in 2005. Both the countries France and italy have a constant change over the period. in 1995 france spend of about 55 million dollars and later this increased to 75 millions by the end of 2005. The given graph compares the money spent on books in 4 different countries in the 10 year period. Overall, it is immediate apparent from the graph that the trend for all 4 countries is upward. To begin,in comparison with the other 3 countries, Germany was the most popular country which witnessed more sale in books from 1995 to 2000. In 1995, the figure stood at around 80 million dollar,reaching at 90 million in 1999, then it dropped suddenly to 85 in 2003 before reaching a peak at 95 in 2005. In sharp contrast, France and Italy show similar pattern,the sales of books started at around 50 in 1995, there was a steady increase in spending of money on books in France throughout the timescale, whereas spending in Italy fluctuated wildly between 1995 to 2005 starting and ending at 50 and 62 respectively. Considering Austria, it experienced a sharp increase in book sales for the last 5 years, exceeding that of Italy in 2003 after rising steadily for the first 5 years. The line graphs provides information about the variations of books expenses of four country (Italy, Germany, France and Austria) over a period of 10 years ending in 2005. The outgoings of the books are measured in dollars. Overall, it can be clearly seen that despite the fact that every nation showed an upward trend during this decade, the most increase of amount of money spent in order to buy books is given from Australia citizens especially in the second half of the period given, from 2001 to 2005. Looking into the details, it is possible observed that between 1995 to 2005, Germany remained at the first position in acquiring books, showing also a marginal rise, approximately two tenth of its initial value, from $ 80 millions to just under $ 100 millions. Furthermore, books sales in Italy and France increased slowly, 10 and 5 millions respectively. Nonetheless Italy had a rise during this decade, it lost the second position bring overcome by Austria which purchasing had a dramatic growth, almost the double of its initial quantity, from $30 to $60 millions.